Roderick Bobbitt scored 30 points and grabbed four rebounds and Stefan Jankovic added 21 points and eight boards this afternoon to help Hawai’i rally past Auburn, 79-67, for third place in the Diamond Head Classic. 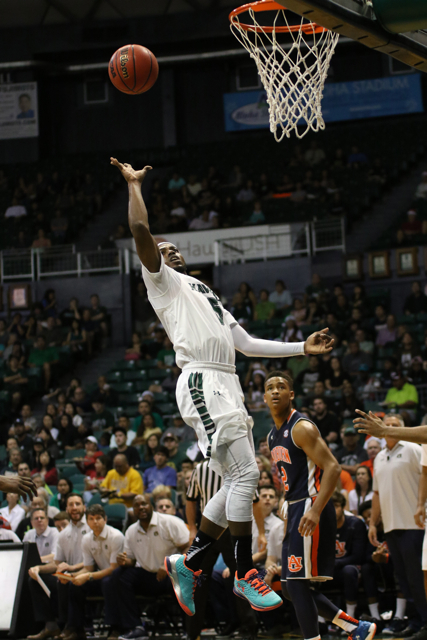 A spirited Christmas Day crowd of about 5,000 watched the Rainbow Warriors improve to 9-2; The Tigers fell to 6-5. UH took the lead for good at 64-63 on two free throws by Bobbitt with 6:42 remaining and finished the game with a 10-0 run int he final 2:42 to seal the victory. Hawai’i started fast, jumping out to leads of 5-0 and 16-8, but Auburn fired back with a 10-0 run bookended by Tyler Harris’ 3-pointer and layup which gave the Tigers their first lead at 18-16. Bobbitt answered with a 3-pointer and Jankovic’s driving layup put the Rainbow Warriors ahead, 21-20, with 6:48 remaining, but Bryce Brown knocked down back-to-back 3-pointers to ignite an 8-2 surge that gave Auburn a 28-23 lead capped by Horace Spencer’s layup with 2:50 left. UH closed it to 30-29 with 1:06 remaining when Stefan Jovanovic put back his own miss, and Isaac Fleming went to the line for two free throws just before halftime, but missed both so the Tigers’ 30-29 lead stood at the break. The Rainbow Warriors opened the second half with a 13-3 run started by Mike Thomas’ slam dunk on after a baseline drive and capped by Jankovic’s layup which put Hawai’i ahed, 42-33, with 15:08 left in the game, but Auburn stormed back with its own 13-1 surge capped by Harris’ layup which put the Tigers up, 46-43, with 12:49 remaining. Nice win with the help of the refs. The officiating.. I don’t know. either way.. fouls on UH.. and critical charging calls on Auburn guys going to rim..
Rod Bobbitt MOP.. really shoot that 3 ball well. when wide open…really improved his shooting.. other guys.. UH still has to have 5 starters nearing double digits.. to have shot at BWC titles and NIT or NCAA.. I guess, hangover from previous 2 games. and stuff. Good win.. I think UH has 2 more pre BWC games.. they should win.. and be 11-2 heading into BWC play starting with 2 at SSC home..
kind of junk when calls decide games too.. oh well. NCAA sanctions don’t faze this team. In all 3 games Hawaii’s defense at the end was superb. That’s the hardest time to clamp down but Hawaii seems to have that little extra to make stops. That’s championship caliber. Glad that Ganot took out Quincy at the end because he would be a liability at the free throw line. Our offense can and will get better. it was enough to win. Bobbitt should be mvp of the tournament. He was the difference in all three games. Fact we might have been 0 & 3 if he didn’t play. I don’t think we have seen Hawaii’s A game yet. Individual performances yes. This team has not reached it’s potential yet. But defensively it’s right up there as good as it gets. If we continue to improve we will be in a good position to take the Big West crown and Tournament. Merry Christmas to all. Yea! No tech from Fleming? Teams are really starting to shut down his all lefty game…. Fleming Is doing what he’s aloud to do go left corner or right corner wait for the ball and play de .He can go left or right the offensive sets are not in his favor. Know the game before u speak if he had the green light like others the sky is the limit. He now understand that this is not his fit but will do what the coach ask. Fleming is doing okay. He comes off the bench ready to rock and roll. If he can’t hit beyond the arc he attacks the basket or dishes off. Just show em up on the court, baby! Just to be clear, I think I got what you are saying.. even though team is doing well, we like it. 9-2 not bad at all, and 3rd place finish,,almost beat Oklahoma etc. Ganot is not using Isaac , properly? Or he is just following Coach’s scheme? just wondering. Isaac is a good Basketball talent no question..
And.. Ganot and team NEED Isaac, All the core guys to win BWC .. definitely.. Guess BD is saying IF thinks he doesn’t fit Ganot’s offense, but in really it’s does. He takes the open 3, he has the opportunity to drive, it’s not all about running and gunning which mostly starts with their d game. Pocho, I think so too. Fleming, Isaac is team first, and Win first.. a real gamer. sad the recent happenings.. so it is hard on team, however servante .. you are right. and WE all know that..
Otto coach or Eran. they ARE NOT PLAYING on the court.. it is Janks, Bobbitt, Fleming, Q, MT, AV, Jovanovic, and Sai.. they are saying UH.. whatever was done. we just going to win. might be last time we see these guys as a unit. hey, go for record 28 plus wins this season, that will never be vacated by NCAA. . these guys.. core guys from last year.. are dynamite.. and Sai good role guy.. grad student and future MD ! Pocho now that you mention it.. I think both Janks, and Bobbitt background,.. that perimeter and structure BB background. they are real comfortable.. however for Isaac Fleming. to be part. and buy in to help UH win. that says a lot about the character of bigdaddy’s son.. Isaac is a very good ball player and has helped UH MBB win so far total of 31 wins over part of 2 seasons. last year’s 22 wins and this year so far 9 wins ! Did I like that high flying up and down pace of otto? yes.. however great to have some slow down , half court things. too. and The Defense as was mentioned. awesome. .. all the great UH MBB teams. and even the Wooden UCLA teams. were great defensively..
Isaac do not fit Ganot system because of his IQ he’s using other tangibles to stay on the court. That’s the eastcoast swagger if he goes to breakdown mood he will sit review all game film.Ask the coach do u got plays for him negative. SMH just finish in good standing. Everything else will work in his favor. NOW we understand.. things are run for Janks, AV, Bobbitt, Sai, Jovanovic, Thomas, etc.. not Fleming specific..
hmmm.. loved that Isaac stayed last year.. that was a MIRACLE season.. Otto almost guided them, with Isaac’s help to NCAA tournament. and for Isaac 2 times after that season to decide to stay for another year.. we thank you, your family and your friends. and I KNOW Isaac follows social media..We love you Isaac.. one of best guards. in class with the AC Carters, Reggie Carters, Tom Hendersons.. from the eastern part of USA mainland..
bigdaddy, Isaac smart young man.. tell him. at least from this old die hard UH MBB fan.. just finish REALLY well in school. .. then , whatever happens.. wish him the best.. he is special ! Well looks like Hawaii will have this year to make a run to the tourny, Anything less than 1st in Big West will be a Disapointment. Get Fleming out of the corner Ganot, your limiting his crafty ball handling and trying to make him a strictly shooter & that’s not his game he’s a creator which means u need space to create an open look for a nice pass or shot. This pass the ball around the key offense will only last so long we need more open the playbook up. Maybe he’s just waiting to conference play idk, also Janks need to stop shooting every touch he gets everyone else passes the ball accept him any1 else notice lol but good win bows..
NCAA tournament run, would be great finish to this season.. for all concerned.. I was thinking about that too? Isaac at the Point, he can handle, defend, facilitate, shoot FT well, good vision.. and move Rod to 2 guard. plus Spectator, that is a given. this IS PAYOFF year, with these guys.. this year or bust.. NCAA. or at least NIT . as we all know. the athletes that first 7 or so.. tremendous heart.. however. . live and die by the 3 ball.. as we can see with even games against Oklahoma, they started , that OU guard, hot, then cooled down. and Auburn. just jacking some threes. at end. I think THAT IS the direction Ganot wants his team to be. that San Antonio, Randy Bennnett, Sort of flex motion. . however.. popping a LOT of threes.. have to have drive into the paint.. inside. score at rim.. too. Will be test in BWC on the road. for UH. and against Mamadou.. plus teams that can cover Rod or Janks. or AV..
Ganot, why not? unleash Isaac Fleming? maybe he reeling him in? As long as they win. and Isaac , sure tons of options.. Almost had it.. remember last year, a player did not box out, Wichita St got ball back , scored, and won that game by either 1 or 2 points.. UH had it that win in the bag..
however to play Oklahoma,.. who if they win the DHC championship, I don’t know the score, or did Harvard upset them? Oklahoma would be undefeated and number one in country. Always so close, however.. have to wait. till next time. hey in ANAHEIM.. the bows/ warriors, finish what they started last March 2015.. go get it.. NCAA dance ticket ! BWC crown is UH to take depending on coachig. Oklahoma won.. they just might be number BPI One or number Two in the land, this Sunday.. real time RPI.. undefeated at 11-0.. or stay at number 3.. because of who they defeated.. lower BPI..? so,. good job Bows/ Warriors.. we stay proud of you all. stay healthy. and make the grades for APR..THIS YEAR..get it. !! You all Know your basketball, for sure. and your son. JUST kidding, You sure you are not Isaac Fleming? himself, the one man fast break, unreal finish at the rim.. ? One thing. Isaac had to endure.. having 3 Head Coaches in span of little over one year. that is huge change. we thankful. and Ganot.. man he is blessed.. really backed into a great group of athletes. and some terrific guards. and team that is peaking, at right time. bigdaddy.. Mamadou, How UH beat them, Irvine? is big.. with 2 great guards.. ? I remember, before Isaac Fleming came here.. Isaac Fotu, was our 4/5. he just drifted to corners , left and right, 18-19 feet out and hit jumper after jumper.. for 30 points on the road.. Mamadou at 7’6″ 300 lbs could not get out to stop him. Then G Money, Nevels.. hit for 16 or 17.. with floaters right over Mamadou.. and of course Shamburger the PG before Bobbitt, hit that miracle 3 pointer to send game into OT over Mamadou.. then UH won probably one of the best BWC road game wins in recent history.. real recent. Tell your son. hang in there.. 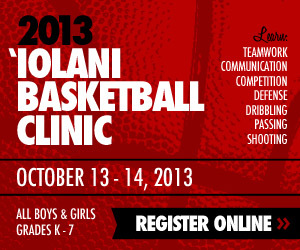 UH MBB to go NCAA or NIT.. this is the year.. has to be. Isaac Fleming hang in there. you guys will be 11-2 soon, before start of BWC play at SSC. 6000 miles seperate us no games on the eastcoast = what? “MAN UP” ( come on) aka coach how did he get this far ? Do you know him NO.Review your film past 1st guard just to slick for your liking a metropolitan kid but good win for the program.MERRY CHRISTMAS see you at the conference tournament. not the Tyler H. thing again? just kidding. now can they win on the BWC road? I hope so..
“Come On..”EG, JM, CA, J.? one of MBB coaching staff?.. wild and fun ! hey bigdaddy.. glad that Otto had pleasure of coaching your son. Ganot. he backed into a great ONE season at least run with Isaac Agent Zero Fleming. one of the best all around guards to play for UH. very talented..! team needs him.. Fans love his effort.. Anaheim.. UH MBB team. just Get IT !! UHfan, I’m dad with no connection to nothing in Hawaii and will not becoming to UH in the near future to political for my likings. sorry bigdaddy, did not mean to be insensitive..
Hey, look. I know that Isaac was heavily recruited by some major schools, a particular ACC one. a good one. and with Otto, on point, previous staff, kept contact with Isaac, we were blessed, I was so happy when watching the video hilites of Isaac, his competition at those prep showcase tourneys, he was so smooth, and a great talent. Till the Last minute, we know schools were after him.. and then. Isaac LOI signed with UH. very very fortunate we MBB fans are..
Me too.. I don’t like how poltical UH has become, the guardians, the leaders there.. should take care of your sons.. and even have heart for you parents so far away.. must be very, very hard. being far away from Isaac.. I know he loves you all.. He plays with such passion. he could have been playing in East for Major DI schools, that is a given. Wish you the best.. Hawaii. and UH. yes, it is a disappointment. .. what has happened.. however. your son Isaac Fleming, he is a good one.. He do well in school. finish this run to NCAA dance.. .
then wish you all the best..
No, you and other UH MBB athlete families. I am sure are Tired of Politics at UH and in Hawaii.. it should not be that way. hope they get it straight. hurts a lot of people. Mahalo, thankyou for your comments bigdaddy94.. really appreciate it. and thanks for sharing your son with us.. same as I thanked another father for sharing his son from far away down under..
Congratulations Rod see you in Anahiem “ROSCOS” lol. This Week, Mid-Major TOP 25? 3rd place finish. Pretty good considering all the negatives before the tournament. I just enjoy watching this team. So much energy. as far as I know the game of basketball is not an individuals game as it’s made up of a team of players. I would think most definitely Ganot’s offense has plays for Issac or for that matter his position. And as it seems he has the opportunity to create or just shoot it if he’s undefended beyond the arc. Issac’s a good exciting player but he’s not to be a one man band out there and I he understands that playing the Ganot’s game. bigdaddy your like most other Dad’s out here watching their kid participating in sports. I don’t blame you, lol. That doesn’t make sense and I’m not convinced. I refuse to elaborate on this topic let’s see what happens the remainder of the yr.